Family life isn’t often easy and it’s never straight forward but if you can accept that’s the case you’ll find small moments of joy in the smallest of places. The kind words from your son or the smile on their face when they accomplish something. That moment of peace and quiet when everyone in the house gets along or the occasional time when your older son helps the young one. If you focus on those moments of joy they will always easily outweigh the hours of angst and worry, the tantrums out of nowhere from the lively young ones, the awful lashing out of the older ones during the teenage years as they use you as a verbal punch bag just because their mood has dipped. The old story of taking out a bad mood on the ones that do the most for you – heartbreaking for a parent to be on the end of but sadly just the way life is. 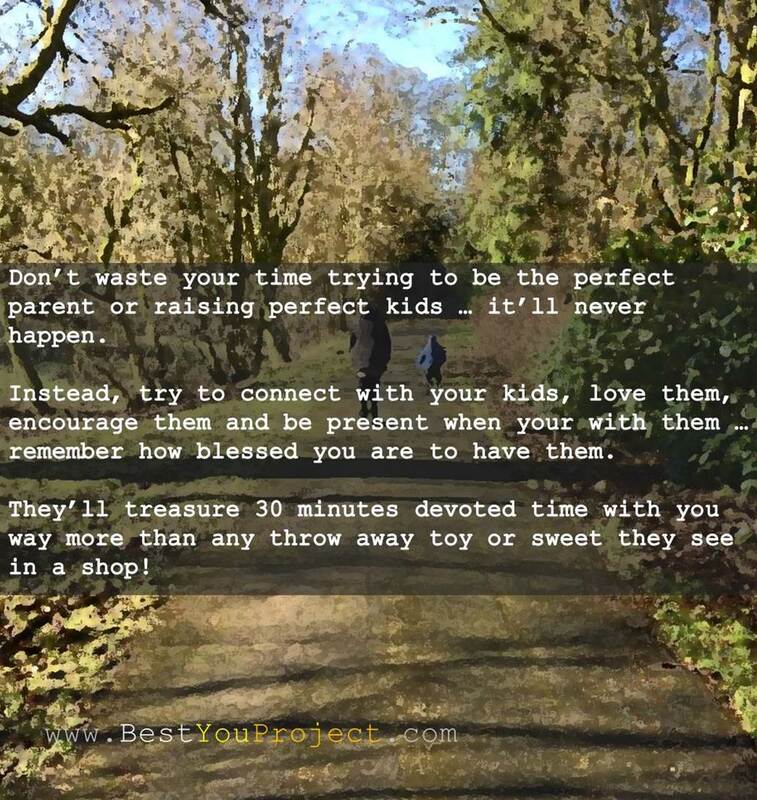 All you can do is keep continuing to remind the child that they are loved, that they are deserving of your time and that they matter! Being a parent isn’t easy, there is no help manual to help you along the way! You find out things the hard way, you discover the negative behaviour isn’t because the child’s personality has changed over night, that instead it is usually a desperate plea for attention … whether from you, their other parent, grandparent or even siblings. No matter what the behaviour, whether it be a tantrum / huffs / mood swings / cheek or worse … you’ll find in so many cases the underlying cause is just a need to know that they are loved. A need to know that they are deserved of your time or a strong desire to just be noticed by you, no matter whether in positive or negative light. I’m a strong believer that no kid actually wants to be bad. They just want to be loved, to know that they mean something. I’ve met many kids over the years through my own kids and through coaching and have to say that you don’t often find a genuinely bad one. Probably one of the wildest boys I know actually has a really good heart, inside he is a good kid screaming for help and going about it in all the wrong ways! Sadly, due to his wild behaviour (fighting, starting fires, underage drinking etc) he is seen as a troublemaker and out of control by so many but it’s obvious for those that look close enough that it is just a child’s blatant attempt to do anything he can to get the attention of his mum. The way he acts is almost as if he is resigning himself to a life as a troublemaker … because that is the label given to him by so many! I really hope that one day he’ll realise the good things he has in his life and, more importantly, that he can CHOOSE a better future for himself. One thing I hope my own boys know is that I’ll never give up on them, no matter how hard they may push us away. They’ll always be reassured that we love them and that we are there for them. The older one, my step son, when in negative mode tries to sabotage his relationship with us as he feels he doesn’t deserve all the good things we do for him. His self worth has took a battering at times over the years and we do our best to build it back up any time it takes a hit. Of course it hurts us when he throws it back in our face just because he’s in a bad mood but we know it’s the mood talking, not him. The guy we see when he’s happy is the real him – confident, polite, honest, caring, likable. The guy we see when he’s in a bad mood is his mood taking over, saying things he doesn’t mean and that he’ll later regret. Being nasty or rude to others, even his younger brother that idolises him, isn’t the real him. It’s just him in a bad mood. We’ll always try to help him, reassure him that we’re on his side and that we love him. Being a parent for me has been a whirlwind education, from being a step dad then full on dad, I’ve took a battering and I’m still learning but no matter how tough it gets I’ll still treasure the good times over the bad. I’ll still keep trying to improve as a dad and I’ll keep reminding the boys that we love them. Nobody said it would be easy but they did say it would be worth it!